Snow likely today – Welcome to Wyandotte Daily! There is a 90 percent chance of precipitation today, according to the National Weather Service. 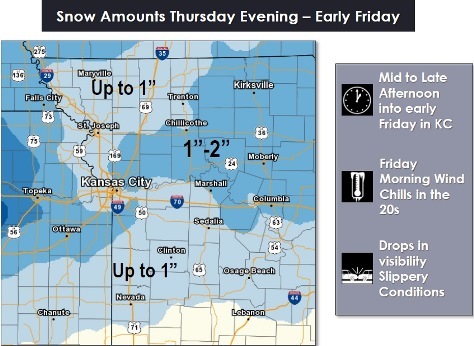 A changeover to snow will occur from northwest to southeast through the day, and will continue Thursday night into the pre-dawn hours Friday, the weather service said. 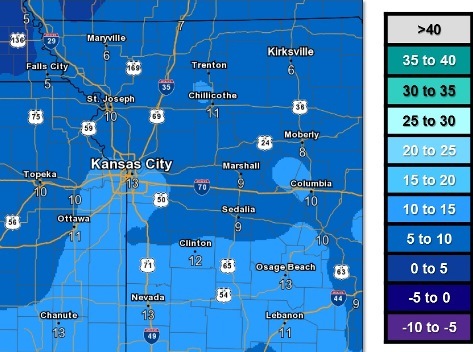 As temperatures drop Thursday night into Friday morning, snow may begin to accumulate on the roads and lead to some slick travel conditions, according to the weather service. Temperatures will not climb out of the 30s Friday into Saturday, the weather service said. Morning wind chills will drop into the teens to single digits Saturday morning. 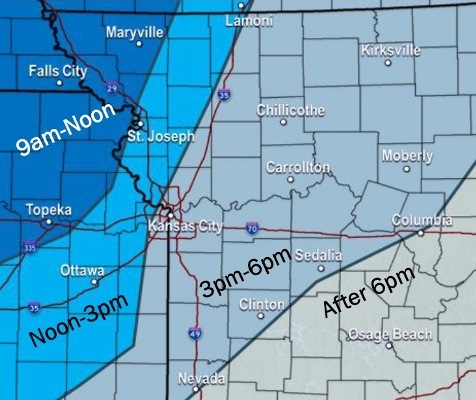 Rain and snow is possible before 2 p.m. today, rain is possible between 11 a.m. and 4 p.m., and another chance of rain and snow will occur after 4 p.m. The high will be 38 with an east northeast wind of 5 to 7 mph. Less than a half-inch of snow is expected in the daytime. Tonight, there is a 90 percent chance of rain and snow before 1 a.m., then a slight chance of snow between 1 a.m. and 2 a.m., according to the weather service. The low will be 28 with a north northeast wind of 6 mph becoming west northwest after midnight. Less than one inch of snow is expected. Friday, it will be mostly sunny, with a high near 35 and a west northwest wind of 6 to 11 mph, increasing to 12 to 17 mph in the afternoon, the weather service said. Winds may gust as high as 26 mph. Friday night, it will be clear with a low of 17, according to the weather service. A north northwest wind of 10 to 15 will become light and variable after midnight, and winds could gust as high as 22 mph. Saturday, it will be sunny with a high near 37, and a light south wind increasing to 8 to 13 mph in the morning, the weather service said. Winds may gust as high as 20 mph. Saturday night, it will be partly cloudy with a low of 30, according to the weather service. On Sunday, Veterans Day, there is a 30 percent chance of rain after noon, with a high near 46, the weather service said. Sunday night, there will be a 30 percent chance of rain before 8 p.m., then a chance of rain and snow between 8 p.m. and 11 p.m., followed by a chance of snow after 11 p.m., according to the weather service. The low will be around 30. Monday, there is a 40 percent chance of rain and snow before 11 a.m., then a chance of rain between 11 a.m. and 5 p.m., and a chance of rain and snow after 5 p.m., the weather service said. The high will be near 38. Monday night, it will be partly cloudy with a low of 23, according to the weather service. Tuesday, it will be sunny with a high near 36, the weather service said. Tuesday night, it will be mostly clear with a low of 26, according to the weather service. Wednesday, it will be sunny with a high near 50, the weather service said.